With a population of 90,253,760, Egypt is the most populated Middle Eastern country. 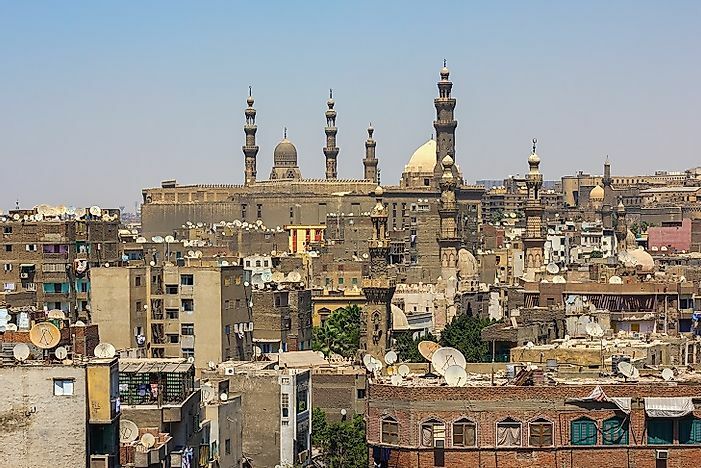 Ancient minarets contrasts modern satellite television dishes in Cairo, Egypt, the largest city in the Middle East. Middle East is a term used to represent the western Asian countries alongside Egypt. Middle East comprises of 17 countries with a population of 371 million. The climate of this region is mostly hot and arid. The countries in the Middle East have huge reserves of crude oil, which have highly nourished the economy of these countries. Islam and Christianity are the major religions in Middle East. The region has constantly remained in disturbance due to terrorism and civil war. Nearly 60 languages are spoken in Middle East and their culture has been associated with ancient history. Egypt, Iran, and Turkey are the three most populous countries in the Middle East. Egypt has a population of 90,253,760, which is the highest in the Middle East. Egypt is a transcontinental country whose lands are shared with both Africa and Asia. Egypt has a total area of 1,001,450 square kilometers. The climate here is arid and has desserts. The economy of Egypt mainly depends on agriculture, media, tourism, petroleum and gas. The rest of economy comes from the investment made by the Egyptians who are working in other countries and some big investment companies. The country is famous for its cultural heritage, including its ancient pyramids and art. The second most populous country in Middle East is Iran. It has a population of 78,778,000, which mostly compromises of Shia Islam. The country has a huge deposit of crude oil, which is the major reason for Iran’s healthy economics. Majority of Iran’s economy comes from oil reservoirs and natural gas supply. Agriculture and private trading services are the other sources of economy. Iran has a very traditional, ancient and huge cultural background. The reason why it has UNESCO’s 19 heritage sites. The third largest country by population is Turkey. It has a population of 78,214,000, which predominately lives in urban areas. The country has the 17th largest economy in the world. In the year 2012, Turkey has a FDI of $8.3 billion. Turkey has remained an ace in exports mainly in automotive vehicles. Apart from this, its economy depends on banking, construction, home appliance manufacturing, oil processing, and food processing and machine industry. Turkey has a rich and diverse culture. It is famous for arts and architecture, which have been famous dating back to its ancient heritage. Except few countries, the situation of Middle East is alarming. Several of these Islamic countries are indulged in civil war due to many reasons. The extremism and wahabism in these Islamic countries have forced the religious minorities to migrate from these countries to other safer ones. The extremism and conservative atmosphere has reduced the art and scientific research in these countries. This has caused lack of employment, illiteracy and terrorism. Millions of people have migrated to save their lives. Many Islamic countries have seen a rise in population at 1.4% but have also forced the major population to migrate to other countries which has created unbalance. It is necessary for the developed nations in this region to work in a synchronizing way to make a peaceful Middle East. What Languages Are Spoken In The Middle East?